Production of helicopters in Russia has soared 66 percent since 2009 - a record in the Russian machine-building industry. Exports are continuing to rise, with the Middle Eastern and Latin American markets showing significant growth, and orders already being placed for models still in development. From May 22 to May 24, Moscow hostedone of the largest events in the global helicopter industry, the 7th International Exhibition for the Helicopter Industry HeliRussia 2014. Since 2005, Russia has steadily increased its production of helicopters – which has skyrocketed 350 percent since 2004 – and in 2009, there was a notable change in the structure and range of machines produced. Exports of combat and attack helicopters are rising. According to Deputy Head of the Department of Helicopter Technology and Services (Rosoboronexport), Vladislav Kuzmichev, the company plans to export more than 300 military helicopters before 2018. "From 2015 through 2017, deliveries under signed contracts will total about 200 helicopters of various types to 12 countries,” said Kuzmichev. According to him, this year exports will remain at their 2013 level (140 machines). Among the most promising markets are countries in Southeast Asia and the Middle East (including Iraq). In 2014, Mi-17V- 5 and Mi-171SH multipurpose helicopters, as well as Mi-35M and Mi-28NE military helicopters, will be delivered to nine countries. This year, Russia will begin exporting the Mi-28N combat helicopter to Iraq. The Mi-28NE was dubbed the “Night Hunter” (the heir of the legendary Mi-24) due to its unique and complex makeup, which consists of antennas, thermal imagers, and other devices that facilitate flight and combat operations both day and night. Due to its impressive weapons and armored cabins, which can withstand 23-mm caliber ammunition, the Mi-28N is often called the "flying tank." Truly unique to this helicopter is the movable cannon mounted on its nose. Its density and firepower allows it to easily go up against any lightly armored enemy vehicles. For combat with tanks, the helicopter is equipped with anti-tank “attack” missiles. Iraq is the first recipient of the Night Hunter, but new orders are expected. Last year, at the air show in Le Bourget, France, Russian Helicopters Director Alexander Mikheyev said that talks to supply the Mi-28NE ​​were under way with several countries. Latin America is considered to be the most promising client for Russian helicopters. As announced during HeliRussia 2014, Russia intends to open a technical repair and maintenance center in Venezuela for the Mi-17, Mi-35, and Mi-26. Before the end of this year, Russia plans to deliver 24 Mi-171SH helicopters to Peru. The deal, concluded between Russia and Peru in late 2013, is the largest in the modern history of military-technical cooperation between these two countries, and one of the most important on the world market for military helicopters. Global sales of Russian helicopters are expected to occupy 20 percent of the market by 2020. However, if exports of medium and heavy military helicopters pose no problems, the outlook on commissioning major innovative new products within the Russian helicopter industry (particularly the new medium-sized multipurpose helicopters, the Ka-62 and Mi-38) will not be so rosy. It is difficult to know when these helicopters will actually take to the skies or what their export prospects are. However, the first orders for the Ka-62 are already under way. Colombia and Brazil are awaiting helicopters in 2016. "The Ka-62 has some problems with its system suppliers,” head of the Analytical Services Agency AviaPort, Oleg Panteleyev, told RBTH. “This is a really innovative and rich machine with very complex, modern, and very promising systems, including flight and navigation system and avionics. However, difficulties in collaborating with suppliers prevented the project from taking off. The first flight is expected to take place this calendar year,” he continued. There are other promising trends in the segment, including the medium-sized multipurpose helicopter Mi-38, which in 2013 officially became the highest-altitude rotorcraft in its class. However, some problems arose. According to Panteleyev, the helicopter is experiencing problems with its engines. “Due to the nature of relations with Pratt & Whitney Keneda, all bets are on engines produced in Russia,” the Aviaport chief said. TV7-117V engines greatly boost the Mi-38’s potential and increase its competitive advantage through fuel efficiency and increased power. Production will begin on an experimental batch of TV7-117V in the near future. Certification for that batch is scheduled for the end of 2014, and mass production will start in 2015. 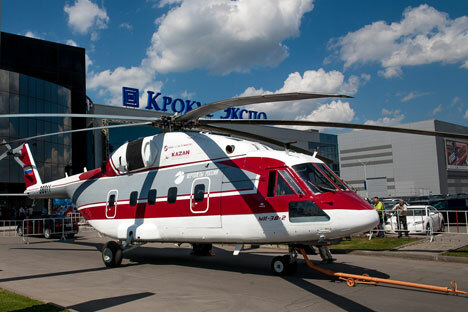 The HeliRussia 2014 exhibition showed that Russian helicopters still enjoy good export prospects. While the fundamental problems of new civil helicopter modifications have yet to be resolved, foreign skies are open to Russian rotorcraft military products.